Ryukyus, Better Issues Balance, of 62 items mostly identified on pages; starting with 1958 Currency Conversion issue varieties including imperf between with some strips and blocks, extensive section of double perfs, marginal imperfs and scarce compound perf varieties, #131S Mihon sheet (cat $1,100), #E1 imprint block, #90 var double perf sheet, revenue gum & perf varieties, 3rd issue 20¢ & 30¢ sheets, 4¢ Iriomote on document and a few interesting covers; worth careful review. Ryukyus, Balance, housed in five albums/binders; includes Postal Agency Brochure collection, 1958 Currency Conversion issue study balance, telegraphic registration seals and other seals, postal forms and a useful sheet hoard; worth a look. 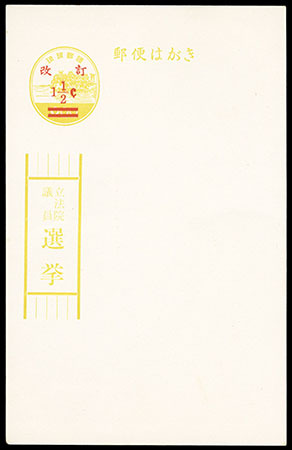 Ryukyus, Postal Stationery Better Balance, of 21 items; includes Air Letter Sheets with #UC2 blue printing omitted (unlisted in Scott), #UC3 var. showing three bars in red surcharge, etc., Post Cards with UX19f error (cat $500), four 1864-65 Mihon overprint cards and 5 Japan Provisional chop cards from Miyako & Okinawa, Paid Reply with #UY4b var. double surcharge card (Scott unlisted) and #UY41l mint and UY4p uprated used to U.S., Official Election Cards with scarce Mihon and better, couple items needing to be checked; a nice group for the specialist. Ryukyus, Election Postal Cards Collection, 1952-68, of 32 cards written up on pages in binder; starting with first 1852 card unused with "Sen Kyo" handstamp and a April 1853 (Special Election ?) variety card unused, 2nd & 3rd Election cards */o, 25th District cards */o, UZE12 mint, 4th Election cards mint, UZE14 mint (cat $450) and good to better later cards including an interesting returned card with attached form label; some soiling on a few later cards but many nice items throughout. Ryukyus, Commemorative & FDC Postal Card Cancellation Collection, of hundreds of mostly postal cards housed in four binders, mostly 1959 cards with modest to moderate duplication, with highlight being two 1950 50s Banyon cards with scarce cachets, some first and last day items, etc. ; a nice group for the postal card specialist. Ryukyus, Tuberculosis Prevention Seal Balance, 1952-71, housed on stockpages in binder; includes some better material with 1952 first issue proof blocks, section of imperfs, sheets with perf varieties, artist autograph cards, etc. ; nice group for the specialist.